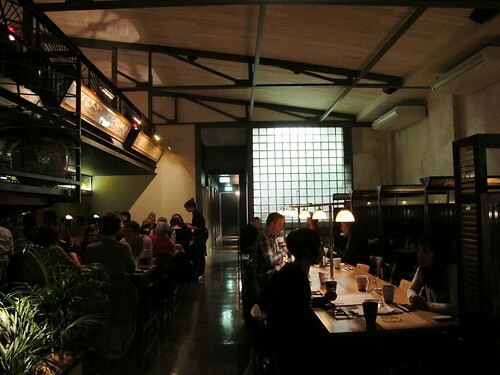 Of the handful of izakaya in Mebourne beyond the confines of the CBD, most are located Southside (En Izakaya in Balaclava, Ichi Ni in St Kilda and the South Melbourne branch of Izakaya Chuji) or in Richmond (Maedaya). 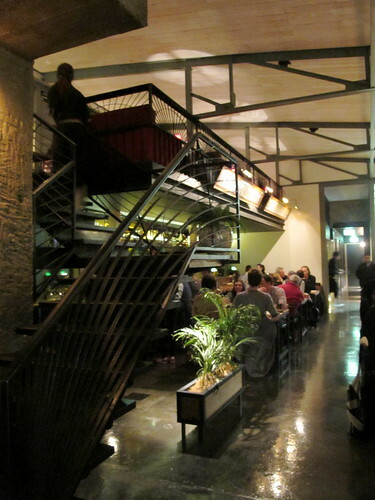 See my previous Melbourne izakaya rundown here. But now the Northside has an awesome izakaya to call its own, with Kumo ('cloud') Izakaya opening last week in Lygon Street, Brunswick East (just up the road from favourites like Rumi and Bar Idda). As a new resident of the Northside, I'm pretty rapt. Restaurant owner Andre Bishop also ran the two Chuji restaurants, Nihonshu and Robot bar, but this is the first izakaya he's had the opportunity to build from the ground up. A trio of talented women have been enlisted: lending her fine dining nous is restaurant manager Sally Humble (former Cutler sommelier), and running the kitchen are Japanese chefs Akimi Iguchi (Yu-U and Bar Lourinha) and Eriko Hamabe (Kobe Jones and Royal George Hotel). The fitout is extremely impressive: the corner site used to be a bank that was built in the 1950s, but the only original elements of the bank that remain are the glass wall separating the dining area from the kitchen, and the old bank vault. The bank vault is now the sake vault, but Andre laments the fact that practicalities and safety considerations forced him to ditch the vault's gargantuan sealed door. The long communal table with framed downlights is reminiscent of a teller's counter, and the antique green lights along the bar beneath the mezzanine level are equal parts bank and State Library reading room. 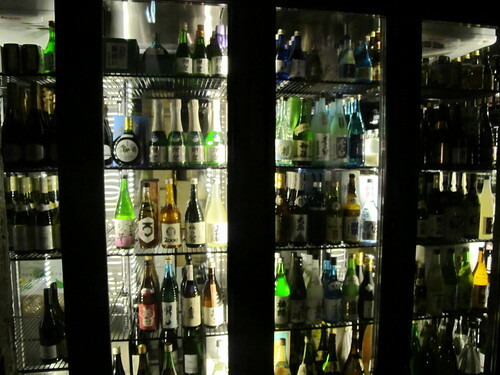 Andre visits Japan at least twice a year, and is an unabashed professional sake nerd. Helping with the sake side of things is Todd Eng, aka @ToddtheSakeMan from San Francisco who is only too happy to help educate your sake palate. 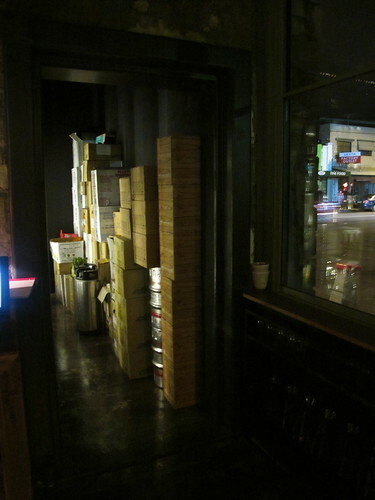 There are also several beers on tap and a wine list selected by Sally that includes some bespoke Mt Langi wines on tap. 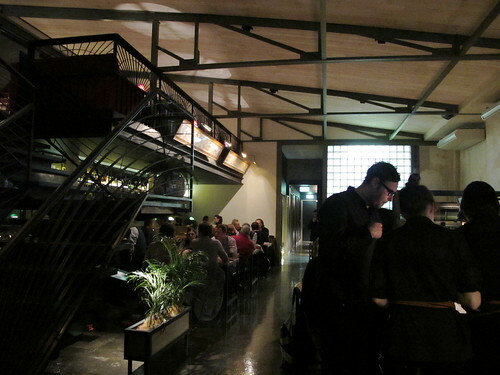 House wines on tap are beginning to crop up more frequently in hot new Melbourne restaurants, most notably Chin Chin. 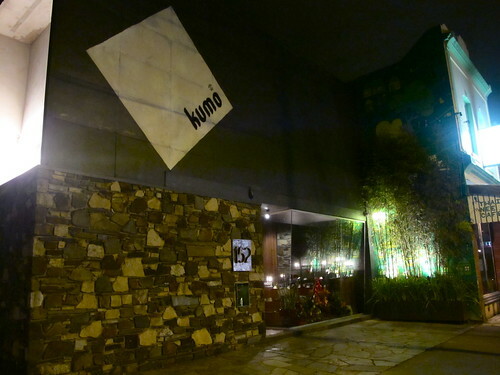 I visited Kumo early on Friday night with the lovely Kate. 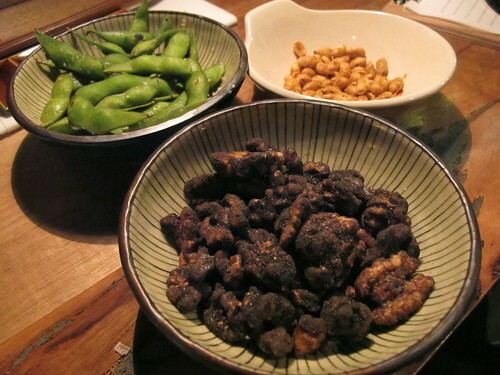 To begin with, Sally brought us a selection of otsumame (drinking snacks): shichimi crispy soy beans ($6), grilled edamame with Murray River pink salt ($8) and pu-er tea infused walnuts ($10). I've noted the prices on the menu but for those keeping score at home, these three snacks were comped. I'd usually indifferent at best to walnuts, but these fragrant, tea-infused ones were freaking brilliant. Make sure you order some. 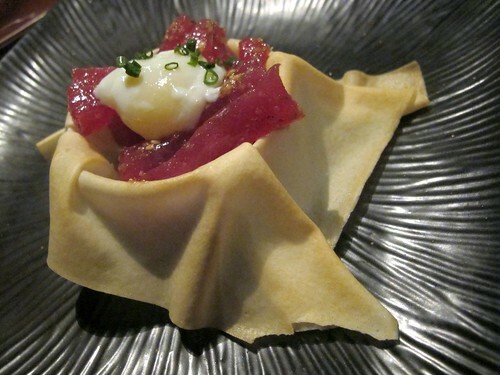 We ordered the tuna yukke with onsen-poached (!) quail egg sitting in a crispy cup ($18) and the salad of thinly sliced seared ox tongue with tomato, wild rocket and horseradish cream ($17). 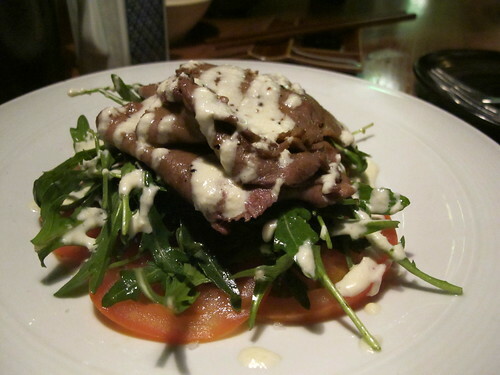 Loved the yukke with its slow cooked egg, but was less convinced by the rocket and tomato in the salad. The ox tongue itself was wonderfully tender though. 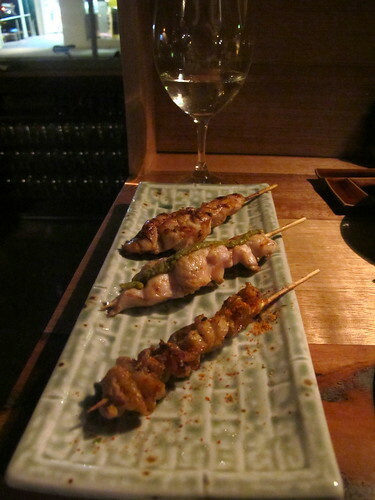 A serve of kushimori (assorted skewers) included chicken skin, thigh and breast ($12). 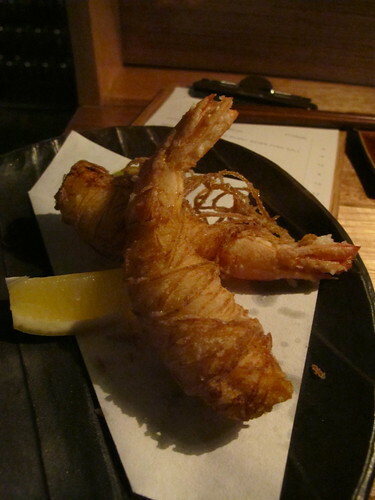 Another standout dish was the king prawns swaddled in strips of potato, fried and served with green tea salt (but at $16 for two seemed rather pricey). But my favourite dish of the night? 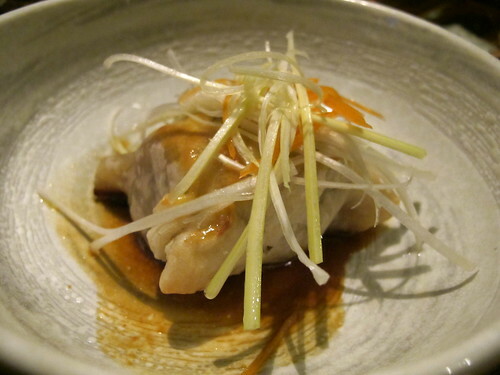 The succulent, incredibly rich, braised Kurobuta pork belly pie ($16). 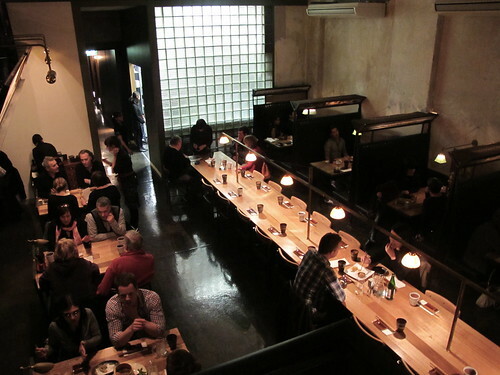 Kumo is definitely at the chic, Den end of the izakaya scale. In keeping with izakaya tradition the servings are small (so as at Den, the total bill can creep up on you a bit), but I love that the kitchen is taking a few risks and straying away from purely traditional fare. Looking forward to returning with a big group so that we can take over the traditional tatami room at the back of the restuarant and really make a night of it! Great post lady and can't wait to get there. Seems like everyone else has but me! I bloody love sake and any chance to speak to the sake master will be taken to learn more. OMG! That pie, it's amazing isn't it. Wasn't sure what to expect, but it is a meal in it's own right. Didn't try the walnuts but based on this I think I might have to. Great pis too. Can't wait to go back. The place looks sleek and I have a thing for places that used to be sort of historic during their time. It's very interesting that his a sake nerd. I've always thought that sakes have the same taste since they look the same to me. The food they serve looks wonderful too! Great presentation and with an ambiance like that, I'm pretty sure it'll be big.